Spend your Whitsun at sea with your loved ones! During Whitsun we have time for each other. Nevertheless, many families experience that fine moments get lost in everyday tasks and time spent on cell phones and TV-screens. How about inviting someone you love on board Norway's largest sailing ship for the Whitsun instead? Get away from everyday life and experience something brand new with your loved ones? On board Statsraad Lehmkuhl you create memories for life! For the first time, we invite you to an exciting voyage to the very heart of the whiskey nation of Scotland. In Kirkwall you can join a guided tour through the famous and award winning 18th-century Highland Park malt-whiskey distillery, a tour that concludes with “a wee dram or two”. There will also be a whiskey master class on board the ship. (Additional order) Experience the amazing landscape of the Orkney Islands, its rich history and world famous single malt whiskey and life on board Norway´s biggest sailing ship! Bergen - Aalborg: A three-day voyage with a spectacular arrival to Aalborg! Learn how to sail as we head for Denmark and The Tall Ships Races Festival 2019! The highlight of the year: The Tall Ships Races international regatta! Sailing, adventures and friendship at sea. One hundred sailing ships and thousands of sailing enthusiasts from all corners of the world. We can already feel the excitement! Welcome on board. Hoy! The Cruise in Company offers seven days of sailing and fun along the Norwegian coast. In this part of the regatta the ships do not compete against each other, and they are free to choose different routes from Fredrikstad to Bergen. Friendship and sailing are the most important ingredients on this fantastic voyage. Are you a rookie when it comes to sailing? No problem! 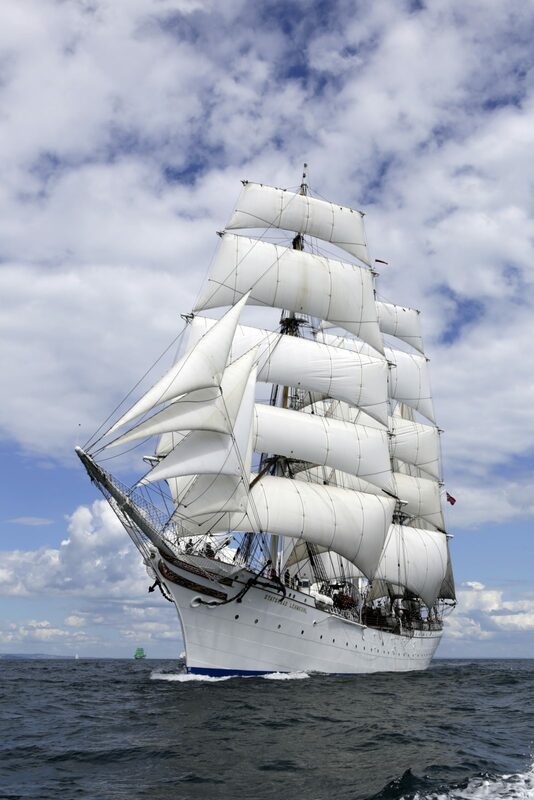 Statsraad Lehmkuhl is a school ship and our friendly crew loves to teach new trainees how to sail! Experience the excitement of the final leg of The Tall Ships Races 2019! In Aarhus, three days of maritim celebration awaits! Even though the Tall Ships Races are over, we are definitely not done sailing! On this short, but sweet, voyage to Bergen, you will get to have both sail training from our amazing crew and also breathtaking nature experiences! Forget all about crowded airports and carbon prints: The beautiful Statsraad Lehmkuhl will bring you safely back to Norway in an environmentally friendly way: Almost 70% of all voyages with Statsraad Lehmkuhl each year is done under sail.